inspection and was attended by some 36 representatives from various organizations in Brazil, such as Embraer, TAP, TAM, IPT, ITA, Fatec and others. The objective of the workshop was to perform a composite repair and inspection on a real aircraft structure, to create more awareness of new aircraft maintenance practices and to launch a joint initiative between Brazilian and the Dutch parties for a dedicated center of excellence on integrated composite repair, inspection & training. 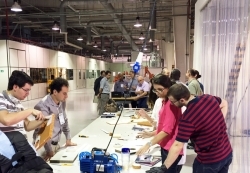 The workshop was organized in cooperation with the Brazilian Aerospace Cluster. 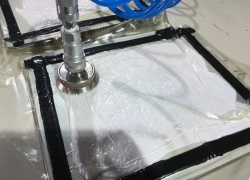 ICRIT (Integrated Composite Repair, Inspection & Training), is a consortium of Stratagem Group B.V., Acrats Training Services B.V., TiaT Europe B.V. and others that provides industrial leadership for global development of sustainable and validated structural repair, automated inspection, inspection data collection & dissemination and training through the combined innovative strength, synergy and complementarity of partners/institutions worldwide.